The cutie in the VW is my nephew Lil Anthony rolling just like his daddy did back in high school when he first fell in love with V-dubs and restoring old cars. Even though last week was a short week it sure was a long one in the work department. I had several late nights in which I only entertained the idea of what to make for dinner upon entering the kitchen completely famished. You see I'm the easy one in the house, if there is a leftover dessert sitting on the counter I have no problem inhaling it, walking away and calling it good. While having dessert for dinner seems like cake to me, the other two I live with just aren't that easy. Hot Dog Dude comes home from work acting like he hasn't eaten in a month. He will mow anyone down to get to the food and will complain if one of the items isn't ready and we have to delay plating. Probably has nothing whatsoever to do with the fact he has cleared his plate before I even get mine served up and make it to the table. I always feel like I lost a competition that I didn't even know I was in. Then there is the kid, who one day eats something, the next day doesn't. Actually I'm beginning to believe what she eats is completely dependent on what phase the moon is in. That has to be it; there really is no other rational explanation for this phenomenon. One day after school she will ask if she can have some chicken nuggets and when I make chicken at home I get, "I don't eat chicken." I think she is just messing with me, but I had to give her a pass this week when she ratted out her Dad for complaining I didn't make dinner before leaving for night school. I made some meatballs earlier in the week, I was even thinking of said complainer when I made them in turkey instead of beef as to not upset his delicate system. If these complaints keep rolling in, who knows what may end up in the meatballs? I'm not saying recipes are in the works, but there is just so far you can push people before they snap. I tried squelching the peanut gallery with some leftover meatballs transformed into subs; it worked so I'm calling it a win. If your hoard is equally unruly, may I suggest the humble Turkey Meatball Sub, I used this Beef Meatball recipe but subbed the beef with ground turkey. I located a jar of Marinara from my stash, toasted a roll with a little butter. Loaded it up with 3 meatballs, covered with a slice of mozzarella cheese and threw it under the broiler for a minute till the cheese melted. Added a little extra sauce, and some sort of peace deal managed to be worked out even if it will be short lived. p.s. In the random chance I start over with some other family down the road; I'm playing clueless in the kitchen. I will know how to boil ramen only and trust me I will commit myself to the role. Your sub sandwich looks fantastic, Gina! Hoping you are feeling better soon. Hugs. The meatball sandwich looks drool-worthy, Gina. I need one too! Do share the recipe next time when you make them again. I haven't had a meatball sub in years! It's actually on my list of stuff to make, but goodness knows when I'll ever get to it. But looking at yours, I think I'll bump it up by quite a bit -- that's wonderful. Beef, turkey, chicken -- I don't care, I'll eat them all! 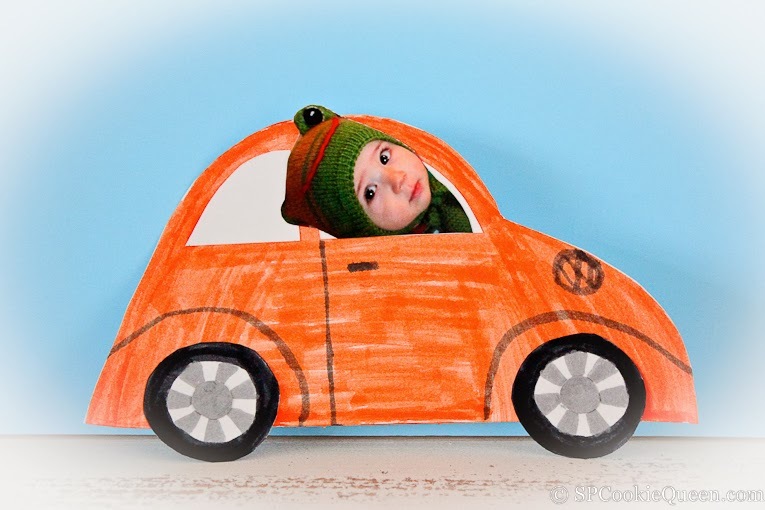 My daughter loved the picture of your nephew in the VW bug and was asking all sorts of questions as to how he got in there, if he's driving, etc. Made for a good laugh. 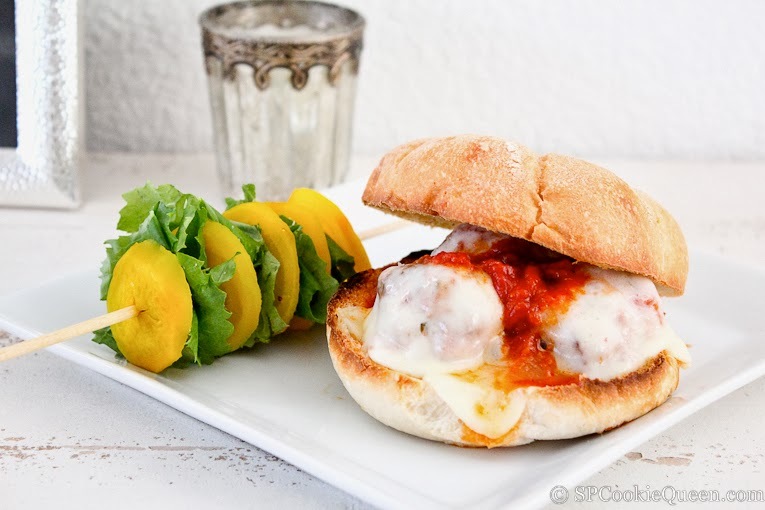 You turkey meatball subs look like an easy weeknight meal sure to please the pickiest of eaters. Hope you are doing well, Gina! What a cute picture of the VW...and what a delicious picture of those subs! These look so good Gina! So how was the show?! I missed the show as I was out of the country but I'm curious how it went. :) Your nephew is adorable!!! It's funny how you compared him with your brother back in high school haha. The meatball sub looks scrumptious!